Background: Available data from South Asia and sub-Saharan Africa indicates that 12% and 34% of girls were married at age 15years and 18years respectively. This practice of child marriage may debar countries from achieving the Sustainable Development Goals. Objective: To extract and present disaggregated indices in the 2013 Nigeria Demographic and Health Survey (NDHS) on the effect of child marriage on health. Method: This desk review study extracted disaggregated maternal and child health indices on married females aged 15-19 years from the 2013 NDHS. Results: The result showed that married females aged 15-19 years were short, thin, and least likely to receive prophylactic Vitamin A dose postpartum and deworming medication at last pregnancy. 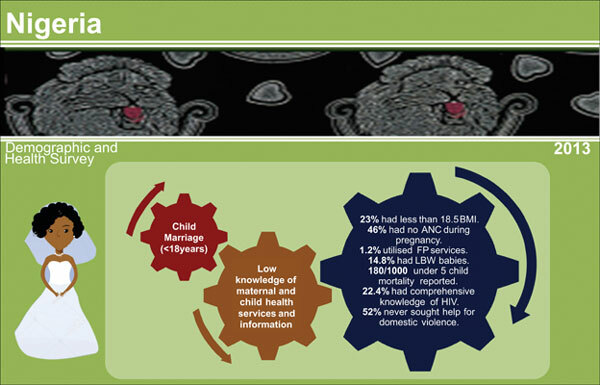 Also, while awareness for Family Planning (FP) was high, its utilization was poor at only 1.2%. Their Antenatal clinic attendance, facility delivery, skilled birth attendance at delivery and post natal service utilization were lowest. Similarly, mortality of children under 5 was highest amongst these mothers. Although violence during pregnancy was highest amongst this group, nevertheless more than 20% of them agreed that the practice of female circumcision should be continued. Conclusion: These findings depict some of the negative outcomes of child marriage on maternal and child survival which require integrated multisectoral interventions to ensure that all girls have access to timely sexual reproductive health services and information. Keywords: Marriage, fertility, antenatal care, family planning, child health, infant and child mortality, human immunodeficiency virus, gender-based violence. Keywords:Marriage, fertility, antenatal care, family planning, child health, infant and child mortality, human immunodeficiency virus, gender-based violence.